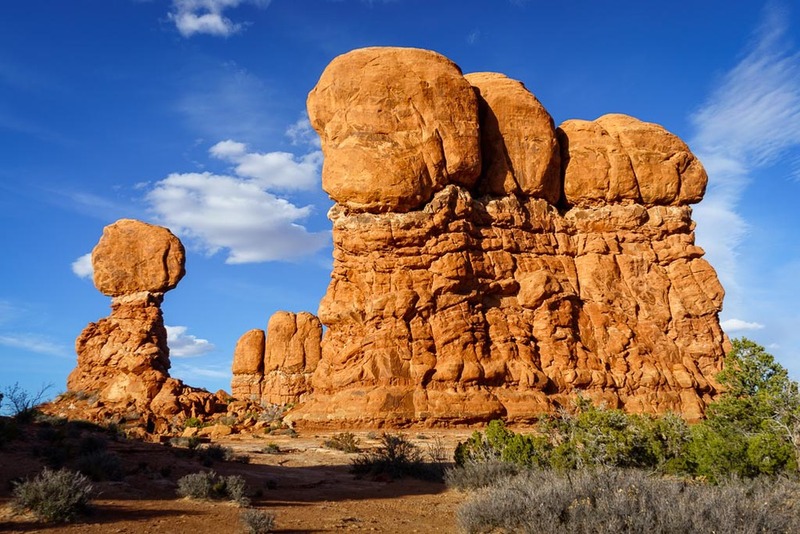 I am sure that if you have viewed many photos of Arches National Park, you have come across an image of Balanced Rock. It is an amazing sandstone structure that reaches a height of about 130 feet, with the rock portion taking up the top 55 feet of the formation. This subject has been photographed countless times by visitors and photographers alike, as it is on the main road in the park and at an intersection with another road taking you to the "windows" area. Given how often it has been photographed, I wanted to shoot it from a different angle than most, and headed toward the back right side. Another reason was to get some of the great clouds that were in the sky. Being in a desert area, cloudless blue skies are the norm, and, even though the blue sky contrasts well with the orange landscape, photographers want the clouds to add interest to their images. I am quite pleased with the result, even though Balanced Rock looks a lot smaller than it really is from this angle (trust me, it is large). The early evening light was great and really conveyed the color of the sandstone.